What happened to the other half of the keyboard? Gone. Vanished. And Matias says "You don't need it." Okay, if half of the keyboard is gone, how does it work? The HalfKeyboard ingeniously maps the right hand side of the keyboard onto the left side. The right hand side of the keyboard is mirrored onto the left side so that touch typists can use the same finger to type letters (while holding down the space bar) they would have with their right hand. Holding down the space bar toggles the keyboard from left side letters to right side letters, so you only type using your left hand. This leaves your right hand empty for all of the stylus tap, tap, tapping that you need to do. Sounds complicated, right? Well, it is, and it isn't. This device exploits your brain's ability to be ambidextrous. The way that it works is in many ways, very natural. While at the same time, I won't say that it's easy. This keyboard does take some adjusting to. It took a few hours for me to really get the hang of it. Let's get right down to the nitty gritty. Is this thing usable? And if so, can I rely on it? My answer is a double edged "yes." This keyboard is extremely high quality. It can stand up to your daily rigors and come out unscathed. The component that attaches it to your Visor plugs in very well. It doesn't take nearly as much effort as plugging your Visor into a Stowaway keyboard. The attachment is quite minimal, but functions like a dream. It connects to the Visor and will not come detached until you press the two buttons on either side of the connector. Some reviewers claim that touch typists can achieve 88% of their normal typing speed on the HalfKeyboard, but I feel that my fastest time was more like 50% of normal time. Others who have reviewed the HalfKeyboard claim that they can type darn near as fast as they can on a full keyboard, so maybe I'm a little slow. But even at 50% of my normal typing speed, the keys on the HalfKeyboard feel much more solid and satisfying than those on the Stowaway. Again, testifying to the quality of this product. One component that I did miss is the raised "nubby" usually found on the "f" key to help place myself. 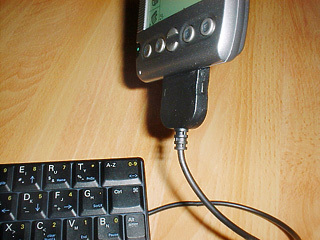 The space needed to use the HalfKeyboard is minimal as well. You only need, literally, your lap, well actually, half of your lap. You can sit down and situate this keyboard on one thigh relatively easily, and type. You can set it up on an airplane tray and type without elbowing your neighbor. Here's the other edge of that "yes." The HalfKeyboard is complex. Typing does take some getting used to. Most of the typing done on the keyboard is intuitive -- a real kudos for Matias. However, typing special characters and numbers are far less than intuitive, and sometimes, downright frustrating.